Millerground is one of the few remaining public access points to the lake on the east shore of Windermere. Above, is the large drumlin known as Queen Adelaide's Hill, which commands spectacular views over the lake with good access to Millerground. Owned by the National Trust, it is free and accessible for everyone to enjoy. Earlier this month the Millerground Enhancement Group met up for a day for a general tidy up and to repair some of the damage caused by Storm Desmond on the Council owned area of Millerground. The group comprising N.T rangers, South Lakeland District Council staff, members of Windermere and Bowness Civic Society and Continental landscape staff set to with a will. Lumps of old concrete, and driftwood were taken away in the power barrows that over the years have proved indispensable for this kind of work. An old fire-site was dismantled and removed. The solid wood benches, that had been displaced by flood water, were eased back into position. Back where it should be. Note the two solid wood benches in the background ready to be re-positioned. Part of the path leading from National Trust land onto Council owned land had been washed away and this was repaired using large boulders and infilling behind with gravel. The path to the lake shore in the process of being repaired. A big improvement was made in a relatively short time to the site and is a testament to what can be achieved through community and partnership working. Most of you may think of Stickle barn as a great location to start a days walk whether this is Stickle Tarn, the Langdale Pikes, Pavey Ark or even Scafell (we suggest the Old Dungeon Ghyll car park for this one). For others it may be rock climbing, ghyll scrambling or mountain biking. For some limited mobility restricts these activities but it is still fair to say the Disabled Ramblers proved Langdale is a valley accessible to all. This is something that the National Trust as an organisation are keen to continue to improve. While this date had been in the diary well in advance we couldn’t have wished for better weather. Tuesday was possibly the hottest day of summer. It registered 33 degree’s when we got back, and felt even hotter on the Walk! 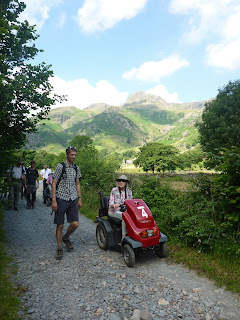 The improved cycle route through the Langdale valley lends itself very well to something a little more robust than your average wheelchair and while we decided to only go as far as Elterwater Quarry it would have been possible to continue on all the way to Skelwith. 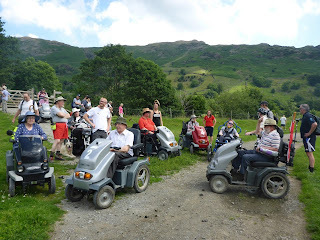 The majority of the group were on Trampers, an off road mobility scooter designed specifically for this purpose , powered with an electric battery with a speed of up to eight miles an hour. these are already available to loan to the general public at Tarn Hows and many of the stately homes. 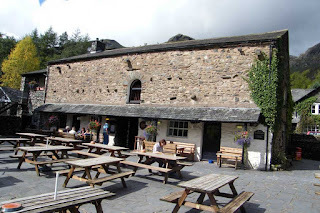 Once chips were mentioned it became a race all the way back to Stickle barn, where the food comes highly recommended either at the beginning or end of your day. 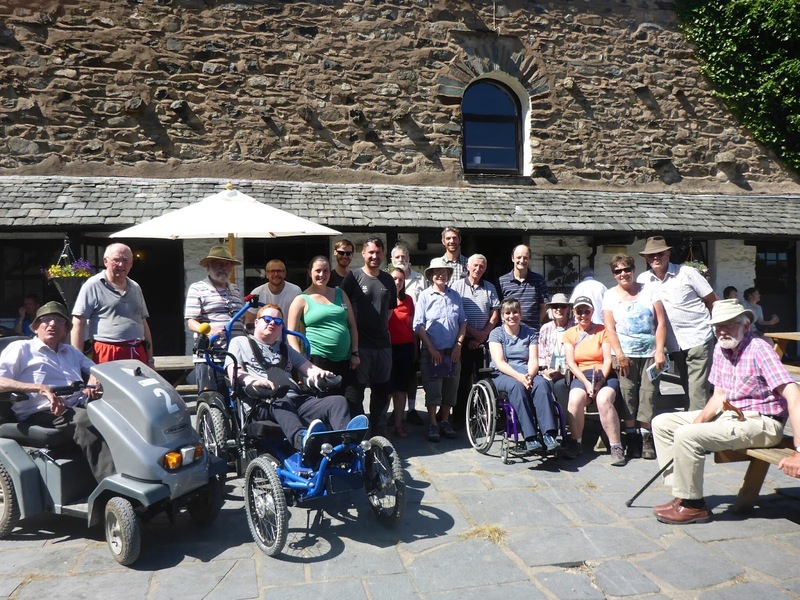 The day was a success the disabled ramblers want to make it an annual fixture on their calendar and we hope to work on adding facilities for the disabled. On the day there was numerous different activities run throughout the valley, from repairing the Gough monument on Helvellyn to dry stone walling at Hartsop. Our task was to resurface and maintain the stretch of path from Glencoyne Bay to Glenridding. Over time the path has started to grow in and the surface has become less attractive to walk on, which has led to people walking around the worst sections. Earlier in the week we had organised our forestry team to drop off a couple of trailer loads of gravel along the path. A daunting site for our 8 volunteers. The plan was to dig a small trench along the current path to widen it to an appropriate width and then fill with gravel. The volunteers soon settled into their roles and the gravel mountain started to disappear. I’m always amazed at how much work can get done when there are lots of people helping, and this job was no exception. The new path beginning to take shape. A huge thank you has to go to our hard working group, for a fantastic days work. As well as our group of volunteers there were a further 15 groups in and around Glenridding completing various tasks. Below is a list of work completed on the day. • 123 volunteers, 15 volunteer leaders and 10 FLD staff. • 2000 non-native invasive balsam plants pulled at Patterdale. • 75m of drainage work completed on Tailings Dam, Greenside. • 25m of drain clearance at Tailings Dam, Greenside. • 200sqm of grass seeding completed at Greenside. • 150 tree guards cleared of bracken to support native tree growth. • Gough Monument on Helvellyn fully renovated and restored. • 150 m of the Ullswater Way path at Glencoyne upgraded with 15 tonnes of aggregate. • 2,500 sqm of invasive Rhododendron cleared at Aira Force. • 25km of upland paths cleared and maintained at Howtown, Place Fell and Mires Beck. • 7.5 tonnes of rock cleared from the beck at Horseman’s Bridge, Hartsop. • More than 300 pieces of cake eaten! If you require further information, or just want to take part on a future Fell Care Day take a look at their website (link above). The Langdale team have been busy removing the invasive Himalayan Balsam between Elterwater village and Rob Rash woodland. Without intervention this fast growing annual (grows, sets seed and dies in the same year) with pink pea-like flowers, can cover vast areas of land. We try and pull all the Himalayan Balsam plants as one left can produce thousands of seeds. There is around a 3-week period between a flower developing and the seed being viable so by the time we see the pink through the trees, we act fast. Due to its location, Elterwater picks up a wide variety of seed washing from the Langdale valley. We had to fight our way through a bamboo jungle to find some of the Himalayan Balsam. Himalayan Balsam is especially common on river banks, shading out all other species and becoming a monoculture. When it dies back over the winter it leaves the river banks bare with no roots holding the soil back, leading to erosion and siltation. In wet areas they can grow extremely tall – they are hollow stemmed and so full of water some of them we could tip upside-down and pour it out! Here Gareth, head chef at Sticklebarn pub meets his match. In this situation Wellies are preferred…. It is all worth it for this stunning view looking at Elterwater towards Skelwith bridge. And definitely worth it for a bit of free cake. Liam (also from Sticklebarn pub) digging in and showcasing one of the larger finds of the day!